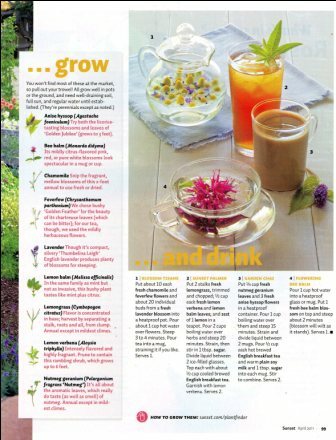 A story about growing and drinking herbs in the April 2011 issue of Sunset magazine is the subject of our latest post in the occasional series on tea styling. My herb garden is currently limited to just sown oregano seeds. Oregano is not featured in the Sunset article but in Edible: An Illustrated Guide to the World's Food Plants by National Geographic (2008) notes that oregano can be steeped and "was considered useful as a mold digestive stimulant...." My garden is a north facing windowsill so I should stick with "easy" herbs like mint and lemongrass. Oregano is a harder herb to grown indoors but not as difficult as basil and sage, for example. I have some dried California grown lavender. Can a dried herb be fashioned into a tisane?